On more than one occasion I have watched birds stand perfectly motionless on one leg in the water. Enquiring minds want to know why. If you believe what you read on the internet, there seem to be two primary reasons. One is to prevent heat loss which is greater in the water than air. 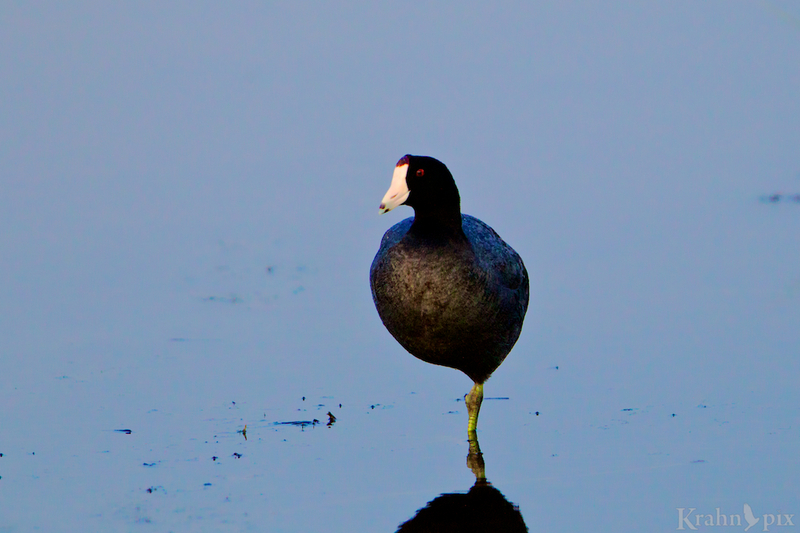 The second is to assist hunting birds – one leg in the water appears more like a reed or stick to unsuspecting prey. Thankfully I’m not gullible enough to get sucked into believing those improbable theories! A much more likely reason is peer pressure. The neighbor’s kid starts standing on one foot and pretty soon all the kids run home and tell their parents that everyone is doing it. After a few unplanned baths, all the cool kids are standing on one foot in the water. The fact that it looks ridiculous and will likely cause arthritis in the future doesn’t seem to deter the birds. If there was a logical reason for doing it, that would be entirely different. Excellent point and photo. It makes wondering minds ask why! I always figured they did it for the same reason I dry my feet after showering while balancing on one leg then the other…centering practice. That’s another great reason I didn’t think of! I have to wonder why they keep practising since they seem pretty good at it. They must be going for expert status. Maybe one day a bird will tell you! You know, “little birdy in the ear” has a story to tell. I’m definitely looking forward to that day. The truth must be told! Excellent. I must make up some more. Glad to hear. Sometimes my quirky humour connects. I’ve always thought it was due to ‘hunting prey’, but then you may find birds doing it out of water as well. It might just releaving fatigue? LIke what we’re doing leaning up to a wall, tree or something? It could be. They certainly have us guessing. I think they do it for sympathy or pity. It took me the longest time to figure out that they weren’t actually veterans of some bird war, come home as amputees. There’s a reason I didn’t think of but it makes perfect sense. I’ve done a double take on some birds and wondered where the rest of it went. When I was very little my dad told me that with regard to flamingos (and maybe it applies to other water birds as well) the reason they raise one leg and stand on the other is because if they raised both legs they would fall in the water. I miss his wisdom. What a great dad comment. It sounds like he was a fantastic guy. I wouldn’t put it past those crazy coots to start anything! I better keep watching. I’ve always thought it was a form of tai chi or yoga. It helps the bird to cleanse its mind and focus on its inner being. I’m with you, Mike. Obviously a very successful form of avian meditation. It must be really effective, or why would it have caught on so? It sure does seem to have caught on. And yes, Mike is typically right. That makes sense too. They sure seem to have the patience to focus. I’m with you. Peer pressure. It’s so obvious. I can’t believe I didn’t see it sooner! Don’t feel too bad. We all slip up now and then.